The project advanced by this forum is urgent: individually and collectively to contest the pitched, pervasive, pernicious intolerance of our age. 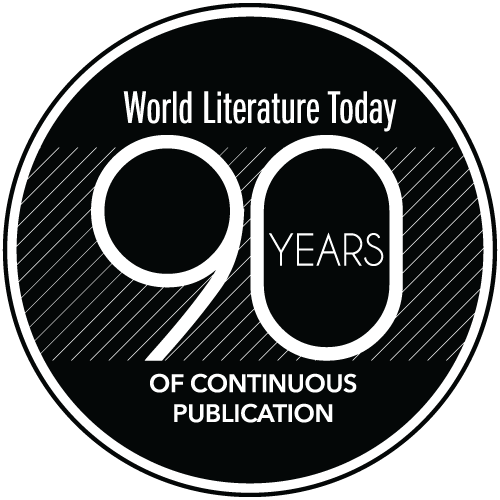 For years, a prognostication by Johann Wolfgang von Goethe appeared on the masthead page of WLT: “These journals, as they reach a wider public, will contribute most effectively to the universal world literature for which we are hoping. There can be no question, however, of nations thinking alike. The aim is simply that they shall grow aware of one another, understand one another, and, even where they may not be able to love, may at least tolerate one another” (On Art and Antiquity, 1828). While many view Goethe as perhaps the quintessential European humanist writer of the early nineteenth century, he was also, as head of the War Commission of Saxe-Weimar in the 1780s and ’90s, later seen as “the poster boy for the ideology of romantic nationalism” (Natalie Bayer). As a war commissioner fighting for the duchy of Saxe-Weimar in the Battle of Valmy and the Siege of Mainz in 1792–93, Goethe witnessed the upheavals of the French Revolution and Napoleonic wars firsthand. Writing in the 1820s, he commented: “The world is in such a turbulent state that every individual is in danger of being sucked into its vortex.” So much for tolerance among the nations. 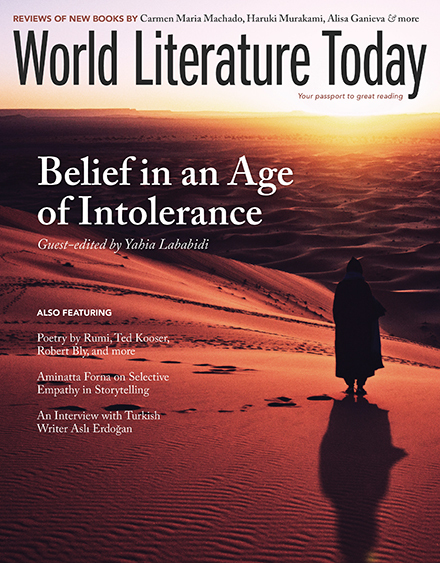 In the midst of our twenty-first-century vortex, the editors of WLT have assembled the current issue around the theme of “Belief in an Age of Intolerance.” As I write this note on the sixteenth anniversary of 9/11, polarizing religious, racial, and political rhetorics continue to divide the world we live in. Egyptian American poet and aphorist Yahia Lababidi, who guest-edited the cover feature that begins on page 39, introduces the topic in a thoughtful essay entitled “Seeking the Light through Literature.” Highlights of the section also include Stephen Mitchell’s creative rewriting of the binding of Isaac parable, my interview with Ted Kooser, and three poems by Mona Nicole Sfeir, which draw their epigraphs from the US Defense Department’s Dictionary of Military and Associated Terms. In the footnotes that appear with Sfeir’s poems online, she observes that the “pantheon of gods worshipped by humans throughout history numbers in the tens of thousands” but also points out that the US military scattered 117,634 land mines, mostly from airplanes, in Kuwait and Iraq during the 1991 Persian Gulf War. What pantheon could possibly sanction human-on-human violence at such an epic scale? The problem of theodicy—namely, “a vindication of divine attributes in respect to the existence of evil,” according to the Oxford English Dictionary—has vexed humanity since the dawn of time. As Lee van Laer writes in his poem “Shhh,” “Our words are weapons, / Heaven trembles at the sight of our transgressions” (page 63). And in his poem on the Martyrs of the Deportation memorial near Notre Dame in Paris, Nicholas Samaras wonders, “Each dot of light for each French person / murdered in the Camps, the seemingly // endless array of them. / How can you absorb or connect it?” (page 60). Yet the fundamentally optimistic nature of belief as part of the human psyche remains remarkably resilient. On the theme of tolerance, Goethe also wrote: “Tolerance should really be only a temporary attitude; it must lead to recognition” (Maxims and Reflections). Goethe hints at the deep etymology of tolerance, which in English is rooted in the Latin tollere (to lift up) and the Greek tlēnai (to bear). Teaching tolerance in the sense of forbearance and lifting one another up is in short supply these days. Like the butterfly soaring over the barbed-wire fence in Admiel Kosman’s poem “Pianist” (page 48), tolerance that leads to recognition of our shared sense of humanity is a belief we can all believe in.